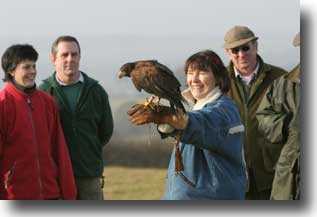 The National Falconry School is an organisation that exists to promote the conservation, through education, of raptors (i.e. birds of prey and owls). We have an enviable reputation among those in the know, and have supplied owls for the Harry Potter films, having been recommended to Warner Brothers. The School runs courses and encounter days for those who share our fascination and passion for owls, falcons, hawks and other raptors. In order to reach as wide an audience as possible, we take our Roadshow throughout the UK, giving displays at events from Hampshire to Perthshire, and many places in between. These displays are renowned for their sheer professionalism, and the passion that the team has for their subject. It is this passion, coupled with a breath-taking display, that makes the National Falconry School’s display team stand head and shoulders above the crowd.